The story featured in this movie is very interesting and quality, but it derails near the end and feels pretty incomplete. I don’t know if this was due to lack of run-time or that the book ends the same way, but it just feels rushed. One of the most beautifully animated movies I’ve ever seen. 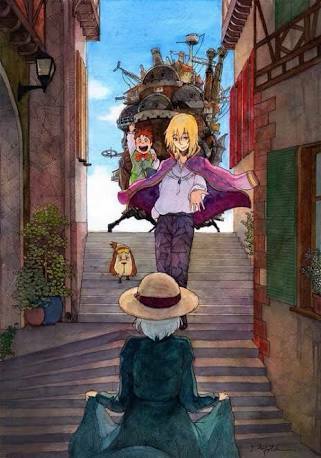 They really go all out on “Howl’s Moving Castle” and the animation is completely baffling throughout. It’s something you need to see with your own eyes, because words aren’t enough to explain the intricate and delicate care put into every single frame and line. The voice actors for both the sub and dub are outstanding, nothing new there. The sound effects and music are top notch too, which is another thing I love about this movie. This movie introduces plenty of intriguing characters, but some of them just don’t get enough time and fall short of expectations. Even the best are hindered by the movie’s ending, even if they had a good deal of development. This is a movie that is flawed due to the rushed ending and not fully realized characters, but definitely worth a watch nonetheless due to its high points. It may not be the best Ghibli movie, but that’s already a near impossible competition to win anyways. I guarantee you’ll enjoy this beautifully crafted movie if you love great visuals and adventure/romance stories. Next story What? You still didn’t watch One Piece?